Munster’s farmers, together with Dairygold in 2017 have contributed €17,500 to the Irish Cancer Society through Wrap It Pink which saw farmers across rural Ireland wrap their silage in pink for the third year running. Dairygold has raised almost €50,000 for the Irish Cancer Society since Wrap It Pink was launched in 2015. This Corporate Social Responsibility (CSR) initiative has the twofold objective of raising awareness of breast cancer across rural Ireland as well as raising much needed funds for a very worthy charity. 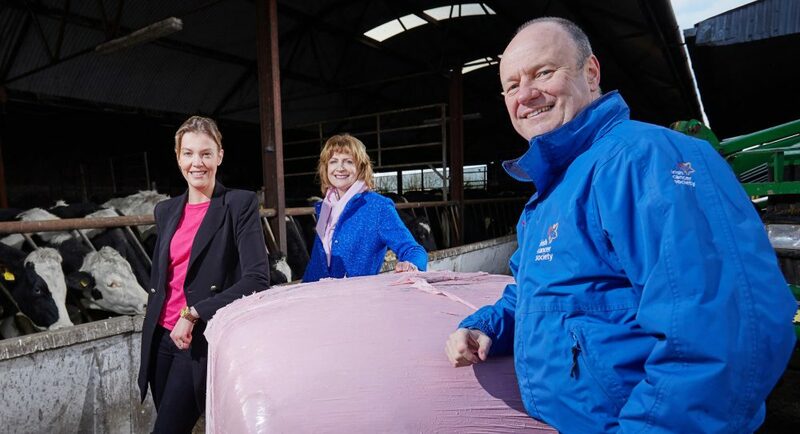 Dairygold’s farmer customers embraced the campaign with open arms and pink bales in fields are a familiar sight in Ireland’s landscape as well as a reminder of the importance of breast check screening among women. Such was the innovation and effectiveness of the Dairygold-led initiative, that many other commercial organisations also embraced pink wrap to raise awareness of breast cancer and raising funds for the vital cancer research and support services. Co-Ops contribute a donation for each pink bale that is purchased. Commenting on the campaign, John O’ Carroll, Head of Retail at Dairygold said “We’re delighted that Wrap It Pink had another successful year with almost €50,000 in total contributed to the Irish Cancer Society since we launched the initiative. As Pink Partners of the Irish Cancer Society, we’re proud to play our part in raising awareness of breast cancer among our farmer members and the wider rural community and we’d like to thank our farmer customers who came on board to support the campaign again this year”. The Irish Cancer Society is the national cancer charity, providing support and services to cancer patients and their families through voluntary donations from the public. Through donations, the Irish Cancer Society provides support and services to cancer patients and their families every day. These services include the Night Nursing service which cares for end of life patients in their homes, the Freephone Cancer Nurseline and 13 Daffodil Centres which provide support, information and advice to anyone concerned about cancer, and the Volunteer Driver Service which brings patients to their chemotherapy appointments.